Order your Tama SLP G-Maple 6x14 Kona Mappa Burl Snare Drum from AMS and enjoy 0% Interest Payment Plans, Free Shipping, Free Extended Warranty & 45 Day Money Back Guarantee. The 6 x 14 inch G-Maple snare drum is built on the foundation of a thicker 11mm, 13-ply Maple/Mappa Burl shell that gives it a bright sound, along with increased volume and sensitivity. Its 2.3mm flanged hoops and separate low-mass lugs enable the shell to resonate naturally, and enhance its punchy sound. Tama's Super Sensitive 20-strand Hi-Carbon snare wires and Evans G1 Coated batter and clear snare-side heads provide excellent tone right out to the box. 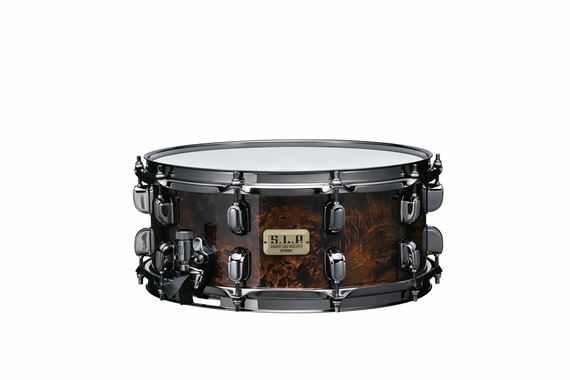 The beautiful Mappa Burl outer ply along with shimmering black nickel drum hardware gives this drum an impressive and attractive look.